Welcome to the Tokusatsu Network! As you can probably tell, we’re a new site; though our members are anything but. We’ve all been part of the tokusatsu community for years and contributed in our own ways to the fandom in hopes of making it a stronger and more enjoyable one for anyone who likes action, fun costumes, and great storytelling. We’ve banded together in our desire to provide a quality tokusatsu website filled with reasonable opinions, the latest news, and exclusive interviews. We’re striving to earn trust in our readership and hope you’ll make the Tokusatsu Network a part of your daily ritual. Being a kid in the 90s, I couldn’t avoid Mighty Morphin Power Rangers even if I tried. Let’s fast forward– past the awkward junior high phase playing Super Nintendo and watching SNICK; through less awkward high school years filled with PC building, World of Warcraft, and anime conventions; and go all the way to college-life where I reconnected with tokusatsu in the form of Dekaranger. Not long after, I found tokusatsu sub-groups, I started reading Rising Sun Tokusatsu, then, after watching Shinkenger, I discovered the Henshin Justice Unlimited podcast and joined the forum. Less than a year after that, I became the mid-season cast addition on the Henshin Justice: Girls in Trouble podcast and after closing that chapter, here we are. I’ve been into this little fandom of ours since I was…well, 3. Seriously, my Mom and I would spend our Saturdays watching Captain Power and Robotech. (Mom would reveal this to me years later while racking her brain to remember “that show with the singer and the jets”.) The downward spiral only continued from there: old tapes of Star Blazers and Ultraman, re-runs of Godzilla VS Megalon, and whatever else I could get my hands on. It’s sort of become a big thing to me. A thing…that has led to even cooler things. Remember that podcast R5 Central? That was me. Friday ACE? That was me too. The system voice in Gun Caliber and Battle Hero Absolute? Yep, you’re catching on. I’m also in stuff like the BBC Audio Drama Award winning series Above and Below, the pages of Otaku USA Magazine, and a song for a really obscure French indie tokusatsu parody. Good luck trying to find that one though. I’ve been into tokusatsu since I was three years old, it was one of those lifelong things. I had my first taste of Japanese tokusatsu during an episode of Space Ghost Coast to Coast which featured clips of Ultra Seven, the third Ultra TV series. I’ve enjoyed action, superheroes, and a mix of tough choices involved in my favorite stories since I was a youngster, making tokusatsu a natural calling of a fandom. My first true foray into the world of old tokusatsu involved downloading a poorly encoded 200px wide episode of the original Kamen Rider series. In my mind, that was as close as I could get to the wider world of tokusatsu. Skip ahead a couple of years and there is a nonstop plethora of tokusatsu available for the masses to enjoy. I pride myself in knowing my tokusatsu history and like to consider myself something of a historian when it comes to this area – and this is knowledge I’m hoping to pass on throughout my stay in this fandom. In the past I have written for various websites, not always tokusatsu related. I’m also one-half of the original Rising Sun Tokusatsu team. Also I’m multilingual, so you’ll see me translating stuff from time to time. I’d say that I was exposed to tokusatsu by watching Mighty Morphin’ Power Rangers as a kid, like most people did here in the US. Even though I did not catch the first season in its entirety, I was consumed by the show from the second season onward. It wasn’t until a few years later that I found out that the footage originated in Japan. While I did do a bit of research into what the shows were in Japan, I didn’t delve into the Japanese tokusatsu genre or start watching subbed episodes until around mid-2006, during Kamen Rider Kabuto and Gogo Sentai Boukenger’s run. Since then, I’ve been on a few tokusatsu-themed message boards before landing on Henshin Justice Unlimited, which is where I met all of the fine people a part of this website. I’ve dabbled in a few things here and there, like helping start the short-lived fansub group Elite Justice Fansubs and doing a bit of writing on the side. In 2009, I started the site Rising Sun Tokusatsu with Sir Kurenai and years later we managed to not completely destroy that site (sort of). Living in Asia as a young English gentleman exposed me to the 80s world of tokusatsu, but I only have vague memories of Metal Heroes and I still have no idea which Ultraman show I watched at that age. I got back into tokusatsu again when Ryuki was airing and stuck with it ever since, though there has been a couple of tough years. Since I got interested in tokusatsu, I’ve been contributing to the fandom in one way or another. I worked with Inui at Elite-Justice Fansubs, founded Grown Ups In Spandex and helped every other toku fansub group one way or another. I started and run HJU News for two years, until joining with rest of the team here. I live in Tokyo, Japan, so I cover events, interviews with cast and crew and occasionally you’ll see me in a show as “white person in the background running away”. A Hong Kong-Chinese located in Sweden. I spent a large portion of my childhood watching tokusatsu, such as Guyferd, Ultraman Tiga and Kamen Rider V3, all dubbed in Cantonese though. I stopped paying attention to it as I grew up, it wasn’t until early 2009 I decided to check out Kamen Rider again purely out of boredom. Kamen Rider Kiva had just finished airing, it was awful but I was instantly hooked. Been a fan ever since, I tend to stick to Kamen Rider but I check in on other shows occasionally. I was never really a part of the tokusatsu community until mid-2010 or so, when I was asked to translate some spoilers for Kamen Rider W. It all started with some short forum posts and evolved into front page posts on Henshin Justice Unlimited. Now I’m stuck translating random news until the day I die. I may not be as passionate or engaged as other fans, but Tokusatsu is one of my childhood treasures and lately, an opportunity to make new friends around the world. 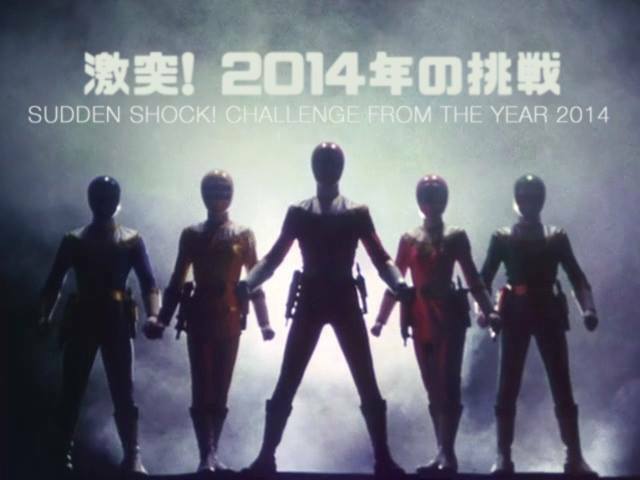 I’m half Japanese and my fondest memories include watching Fiveman with my younger brother on Sundays. After that, we moved back to Mexico (my other half and birthplace) and lived off the sporadic recordings my father’s colleagues did for me on VHS. Power Rangers happened in the US, and the dubs aired in Mexico not long afterwards. My nostalgic glands exploded and after a painful recovery and the democratization of broadband, Tokusatsu and I had a tearful reunion and we’ve been together since. Being able to speak three languages has allowed me to meet great people in the fandom, enhance my experience, enable others to enhance theirs beyond the barriers of language and provide insight into Tokusatsu as a manifestation of Japanese culture. I hope to continue doing this here. I may occasionally help with coverage of stuff here as well as appear with Tom as “not entirely hispanic person rhubarbing in the background”. Welcome! Hope to see more from you! I am so hooked on this. Damn. The crew here is one massive powerhouse. I can easily see great things from these guys. This is the kind of all-star lineup I want out of a Tokusatsu news group. I can’t wait to see where this goes. Always great to see the original A crew return to show them how it’s done! Now I’ve found another source when it comes to tokusatsu news! I’m new to this site, but I appreciate the ambition and love for the genre that is apparent in the staff. Wishing you all the very best and always eager to help in any way I can!